One school in India is cultivating the well-being of students by implementing Greater Good Science Center practices. On a recent trip to India, I was deeply inspired by one school’s efforts to use some of the GGSC’s research-based practices to encourage well-being amongst its students. Similar to students in the U.S., Indian students often struggle with intense academic pressure, high parental expectations, and, for too many, extreme social and economic barriers. Indeed, suicide rates of 15-29 year olds in India are among the highest in the world. But a pre-K-12 Seth M. R. Jaipuria School in Lucknow, under the leadership of Anjali Jaipuria, is helping to counter the impact of these challenges by encouraging students to tap into their own and others’ humanity through the practices of gratitude, self-compassion, mindfulness, and more—all of which are transforming the school. School psychologist Anam Zaidi who led the team that developed these projects recently sent me photos and descriptions of their activities. 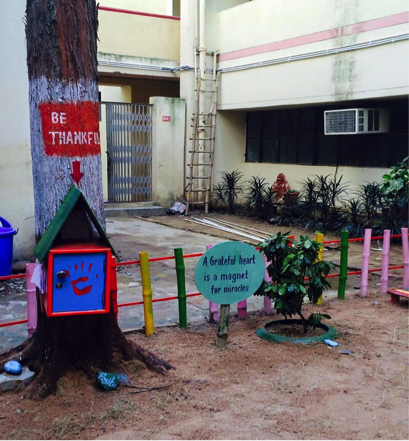 I thought educators and parents might appreciate seeing some of the exciting work happening in India—and perhaps be inspired to try a few of these activities at their own schools. Enjoy! 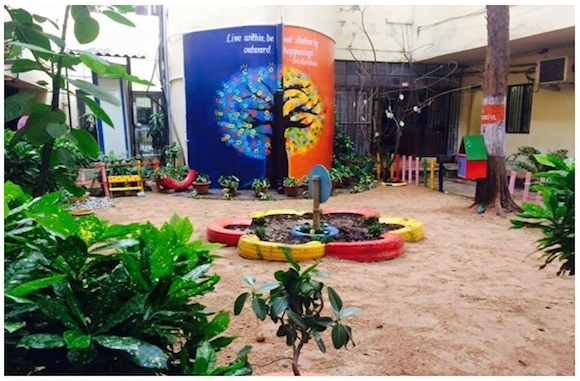 Anam invited middle-school students to transform an unused outdoor space into a place where they could take care of their own social and emotional well-being. 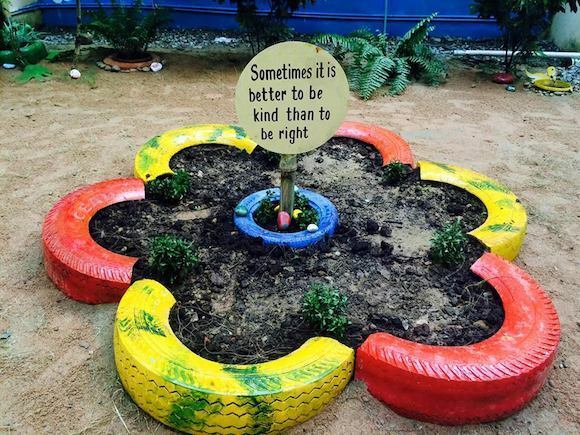 Students spent seven days happily painting fence posts, rocks, and old tires; creating signs with inspiring quotes; and planting flowers and saplings, often with the help of senior students who willingly took direction from the younger ones. They even enlisted the help and advice from the school’s carpenter and gardener, bridging the sometimes-wide gap between social classes by experiencing the “dignity of labor”. The result? A “Healing Habitat” just for them. 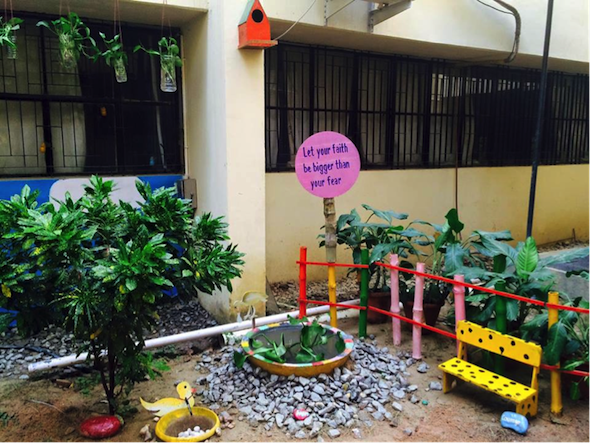 Within the ‘Healing Habitat’, spaces were created to encourage students to practice some of the Greater Good themes. When a student does something kind for another person, he or she plants a sapling in the garden of kindness. Students write on a pebble something that they would like to let go of such as anger or jealousy and then drop it into the pond where it disappears. The tree of silence provides a place for introspection and meditation, particularly if children have gotten involved in a conflict. 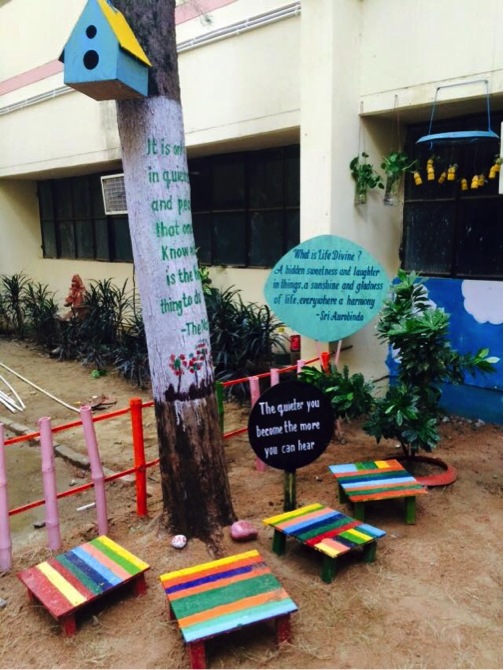 “The tree encourages students to reflect upon their actions by observing a moment of silence,” said Anam. “But I’ve also seen kids just come and sit there.” Teachers, too, are reinforcing the power of silence by opening and closing each class with a mindfulness practice. Students come to the tree to fill out a paper leaf on which is written, ‘I forgive myself for….’, and then they hang the leaf on the tree. At the Gratitude Tree, students write on a slip of paper something or someone they’re grateful for and place it in the box. Anam then pulls out the slips of paper and posts them on a bulletin board for all to see (as long as they’re not too personal). 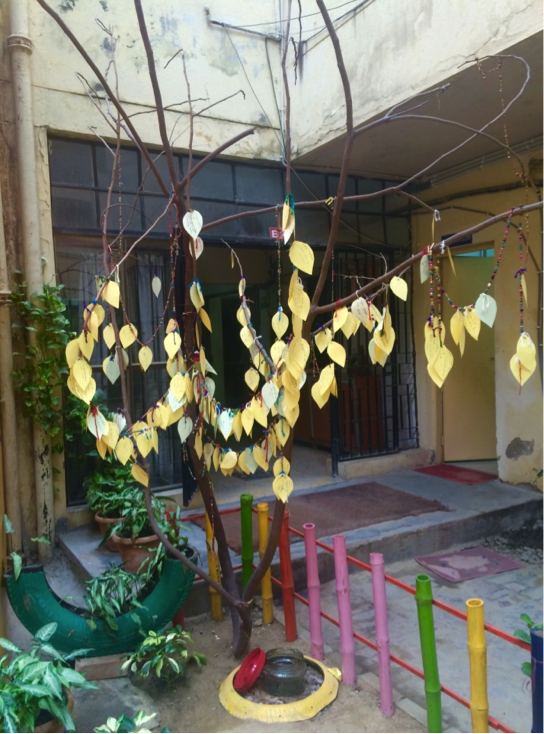 “The tree of gratitude is a gentle reminder to all of us that no matter how busy we are, there is always something we can be thankful for,” said Anam. In addition to the Healing Habitat, Anam has been implementing other Greater Good practices including self-compassion in classrooms. For one month, students in kindergarten through 4th grade practiced a self-hug at the end of each day and remembered that no matter what happened that day, they still had the Divine Spark within which makes them unique beings. Older students wrote anonymous self-compassion letters and then gave them to Anam (all 4,000 of them! ), which, to her surprise, broke the ice between her and the students who were not used to having a counselor with whom they could share their challenges. I feel bad for being a girl because boys get more freedom than girls. Though gender bias is now less that it used to be, still the rights are not there for girls. If a friend had the same problem, I would say that when we grow up, we would make every man in our upcoming generation have respect for women and give her all her rights. I feel ashamed that I have a dark complexion and I also feel very bad about my rank in the class. I do not have many friends and I am not good in studies. Everyone makes fun of my fat and rank in class. If someone else had these problems, I would give advice to never feel that you are a loser. Everyone in his or her life is a loser for sometime, but a loser always becomes a winner when he or she has faith and believes in him or herself. I am ashamed of my height and all my friends taunt me because of my height. But I do not take it seriously because my favorite Cricketer Sachin Tendulkar’s height is small and he has made the most number of runs in cricket history. My advice is to not mind what people say and to listen with one ear and let it go from the other ear. In the end, the work being carried out in Seth M.R. Jaipuria School speaks to the universality of human emotions and values and the need for connection. Providing students with the time and safe space to cultivate their own well-being through gratitude, forgiveness, silence, and other practices that affirm their humanity, Anam has given to Jaipuria students what all children desire, no matter where they’re from—to be seen and valued for who they are by their teachers, their peers, and by their own selves.